On November 14-16, 2018, ISSI-BJ Forum on “Variability and Predictability of Solar-Terrestrial Coupling: the Next Scientific Program of SCOSTEP” was successfully held. 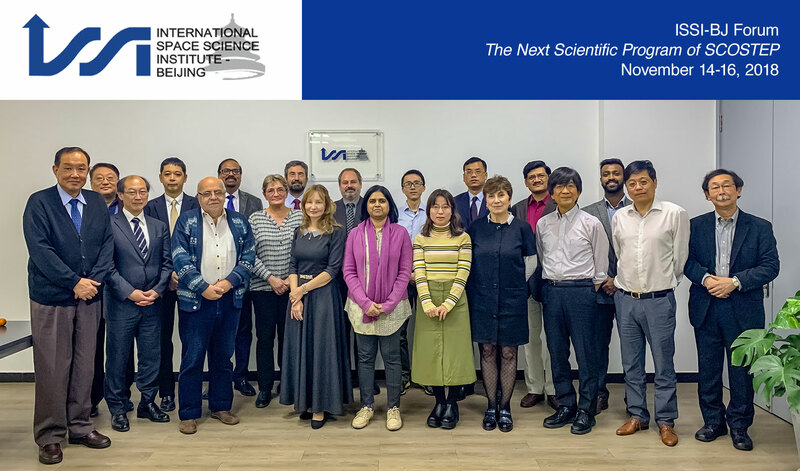 Nearly 20 leading scientists from 10 countries participated in this forum, which was convened by Nat Gopalswamy (NASA, USA), Ioannis A. Daglis (University of Athens, Greece), Maurizio Falanga (ISSI-BJ, China) and Chi Wang (NSSC, China). The main goal of the Forum was to define the next scientific program of SCOSTEP for the period 2019 – 2023. The Scientific Committee on Solar Terrestrial Physics (SCOSTEP) is an interdisciplinary body of the International Council for Science (ICSU). SCOSTEP is tasked with running long-term scientific program in solar terrestrial physics (STP) by the ISC. The participants of the ISSI-BJ Forum worked to define the scientific program based on (i) current status of the NSP document, (ii) participants’ expertise in STP science, (iii) the input received from the community, and (iv) work plan for the final Forum in ISSI-Bern. The Forum started with a short introduction to ISSI-BJ, given by Anna Yang (ISSI-BJ), and an overview of the SCOSTEP objectives and NSP charter by Nat Gopalswamy (NASA). Following that, the achievements and lessons learned from VarSITI activities were introduced, as well as the status of NSP committee activities, with particular attention given to the capacity building activities, and outreach activities. The rest of the first day, as well as most of the second day of the Forum were dedicated to the expert presentations from the fields of atmosphere, solar, ionosphere, magnetosphere and mesosphere-stratosphere). At the end of the second day, the areas which need revision were identified, and the participants were divided into groups to work on these areas. On the last day of the Forum, the working groups started drafting changes to the NSP report, and after a discussion about the drafts and the NSP modus operandi, a combined document was prepared. Finally, the Forum Participants discussed the work plan until the next meeting during the Forum at ISSI Bern. An issue of Taikong, the ISSI-BJ magazine, devoted to the content of this Forum will be prepared after the Forum at ISSI Bern, and will distributed to the science communities and space science institutions.